From August 25th 2012 until over a year later, I slept and lived in my car in Los Angeles, California. I moved to Los Angeles for a dream and did not realize how expensive it was to live there. So I began planning in my head and thinking how I might save money and how I might get out of the frustrating living situation I was in at the time. I decided living and sleeping in my car would be an idea that would satisfy both of those things I wanted for my life in Los Angeles. able to live on my “own” in my car. It didn’t come easy getting used to that life though. There were many learning experiences. I began writing a book while I was sleeping in my car. About how to survive living in one’s car. There are many different aspects when it comes to sleeping and living in your car successfully — many of which require a plethora of survival skills. 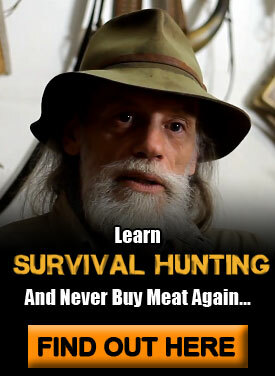 In all truthfulness, it really is a “survival” experience. I was doing this so I could save money and get ahead in life. After all, it takes sacrifice if you want to get ahead in life. That’s what I have learned. Especially in this economy today, you never know when hardship may hit and having these survival skills in your pocket may just save your life one day when you really experience hardship. All in all, I saved a great deal of money and had extra money I wouldn’t have had if I was paying rent somewhere. In this article I’m going to go over a few key aspects it takes to successfully live in your car. Even if you never have to live in your car in your life, it’s good to be prepared. You never know what life may throw your way one day. Canned Foods: There are canned foods such as beans, pastas, and tuna. Have a can opener ready or preferably have an easy to open top. That makes things much easier. Canned fruits or fruits in plastic cups work as well. They store well too. Peanut butter and Jelly sandwiches: These are easy to make in a car and only require a knife to spread it. Homeless shelters: Homeless shelters are a good source of free food. Just find one in your local area. Protein Bars: These are pre-packaged, somewhat healthy and easy to eat on the go. Fast Food: This is a somewhat cheap and accessible option but I generally went for the foods that were in a grocery store as they were cheaper. In grocery stores, they usually have a bakery or already-cooked foods section and these are somewhat affordable as well. I used to get 2 pieces of fried chicken and some potatoes and it was decently priced and nice to have some “real” food for a changes sometimes. Finding the right parking place is probably one of the most key elements of sleeping in your car. 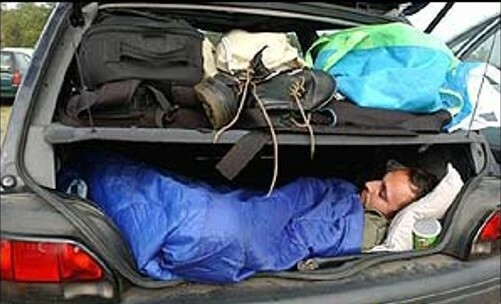 A good sleeping area can make or break you living in your car. You have to find a place that is safe but also a place where you can stay on the down-low enough to not be noticed. I personally parked in the lot of a 24-hour grocery store I used to work at. I lucked out. But I’d say if you can manage to sleep at a 24-hour store somewhere that would be good. Or in a neighborhood that is safe where you can stay under the radar. Once you do find that place, you have to ensure you do everything you can not to be noticed. Part of that is making sure your car is properly “prepared”. For example, I had dark tint on my windows. If you don’t, another option is to put dark towels up in front of the windows. You have to be inconspicuous though and make sure no one is around when you put them up. Just go to your spot, park, shut the car off and set the towels up. That is what I did. Make sure you choose the same place for sleeping every night. It makes things a lot easier. Don’t tell anyone where you sleep. Have the radio off long before you get to your spot so you don’t draw any attention to yourself. Additional tip: do not open your doors once you get to your spot or get out of your car at all. It only draws more attention to yourself. Keeping good hygiene is absolutely key to living out of your car without being noticed. The more attention your draw, the easier it will be for you to be noticed and ultimately kicked out. It’s key that you don’t appear to be homeless and get identified as a squatter. For that reason hygiene is very important. I took showers at a gym. I got a monthly gym membership. It was only $40 a month. So it was not much. I got to both work out and get clean. I recommend having a backpack with everything you need for the shower and a combination lock to lock up your stuff while you are in the shower. Fast food chains: They usually have free WiFi for laptops. If you keep a low profile, it’s likely you will go generally unnoticed. Just make sure to keep to yourself for the most part. I didn’t even buy anything much of the time and no one cared to be honest. Public libraries are great places to hang out in your spare time especially if you have a laptop. There is free WiFi that does not expire like many food places. There are usually a good amount of seats. It is nice and cool inside or warm depending on the climate where you live. Malls are a decent area to hang out at as well. To find a seat and read a book or walk around. Just as long as you don’t have to pay for parking to be at a mall then it’s great. The gym is a great place as well. You can work out for a while to kill time and be inside. Friends: Having social connections are obviously a great way to pass the time. Gallon of drinking water: It’s important to always stay hydrated when living in your car. You are always going, always on the move much of the time. There were many times it was after work and I hadn’t had any water. It was always nice to have my gallon of water in the backseat under a towel. It costs about $.25 to fill it up at a grocery store. Pain medicine: Very useful when you have any kind of pain. There were many times while I was living in my car, it was late at night and my head was throbbing. It was nice to reach in my little soccer bag and take some pain medicine and be able to sleep peacefully after that. Car Fan: At night time I find it tough to sleep without some background noise, so this came in handy. It costs about $20 at an automotive store. It is enough wattage to be on all night and not kill the battery. Many nights it is too hot to sleep in a car without a fan. In the summer time, if I didn’t have a fan I would have suffered greatly. Power Inverter: This is a device you can plug into your cigarette lighter and charge your laptop, cell phone, or any other electronic device as long it is a small enough wattage. It costs about $20 at many stores. Be careful what you charge. Some things will kill the battery if you charge it too long. Try to charge things while driving when possible because it doesn’t use the battery. The one I had had was 100 watts, which means anything you charge has to generally generate less electricity than that. Sleeping Bag: A good sleeping bag is key in any environment. Even in Los Angeles, in the winter and many times other seasons of the year as well I needed it. If I hadn’t had a good sleeping bag, I would have frozen and been very uncomfortable the entire night. Snacks/Food: It is important to always have some sort of food in your car. Preferably on the floor on the passenger seat side as I did. I used that section for my food. It was easy when I got hungry, I could just reach over and grab a banana to eat when I needed it. It’s crucial to always have at least some stuff ready to eat anytime you may need it. Not eating can cause many problems. There were many times after work I was extremely hungry and was leaving work and had a piece of fruit I reached for and ate right from my car. Jumper Cables: Sometimes for a couple different reasons, I found that my car battery died and I needed a jump. Most likely because I left the lights on or I charged my electronics too long without driving. It was a pain standing in front of a store asking people if they had jumper cables. I eventually got some jumper cables so when my car battery died, all I had to do was ask anyone who had a car around me if they could give me a jump rather than also having to ask them if they had jumper cables too. Vitamin C: Living in your car is not a normal thing obviously. There is more wear and tear and hardship than if you had a place to live. So it’s important to keep your immune system up. Vitamin C boosts the immune system. Anything you can consume with a lot of Vitamin C is great. Oranges or any drinks that have vitamin C in them are great. 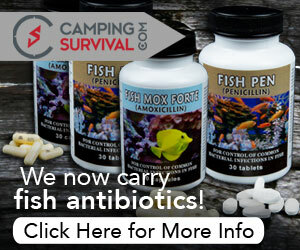 You cannot afford to get sick in your car when you already have enough other things to worry about. Spare Keys Container: Having spare keys around are very important while sleeping in your car. You never know when you may need them. I kept a spare key for my car always in my wallet. Also, I went to an automotive store and got 2 containers for about $10 that store keys and have a magnetic cylinder on the back so you can connect it to any metal at the bottom of your car for when you lose or lock your keys in your car. Make sure to put it where no one can see it. Make sure no one knows it is there. Only you. There are many important aspects to surviving living in one’s car. These are a few of the key ones. The important thing is keeping a low profile in all you do. That way, you can have the longevity to stay in your car as long as you need to. You have to stay mentally strong and continually aware and focused of everyone and everything around you. Keep your head up. Always know it is not forever and is only a temporary situation. 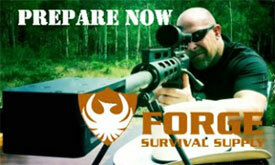 The following article is a guest post by Bill from upstate NY. In this article, I will be demonstrating how you can build a cold frame, which is like a mini greenhouse for the garden. It will allow me to plant my vegetables a couple of weeks early and keep them growing a couple of weeks later in the fall. All of this is depending on where you live and what you are growing, of course. There are also many types of coverings you can use. 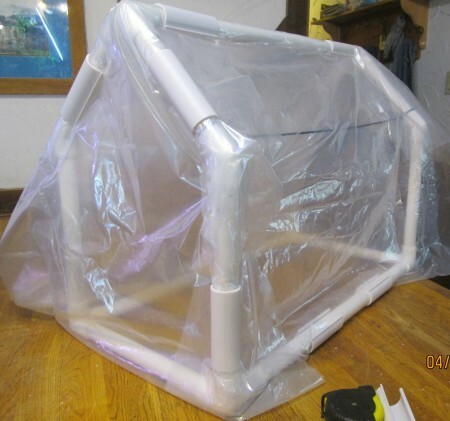 Some plastic sheeting is thinner, some thicker and better for insulating. Some allow more light through and some are used to give cool growing plants shade so they can do better in warmer weather than they normally would. Each has a trade off. Most people I know would rather scrounge around for used and about-to-be-discarded materials. Like a contractor who has just built a house and now has to pay to dump the scrap lumber and other materials he used. Many times, if you ask, he will gladly give you all the scrap lumber you want, as long as he doesn’t think you might steal anything. You can usually find old windows and frames in good shape, which are great for a do it yourself cold frame. What I chose to do is use lightweight PVC for this project. Schedule 40, furniture grade in 3/4 inch (inside diameter). I used white to save money but you can buy them in all kinds of colors or even paint or stain your own. For the most part, hardware stores and places like Home Depot will stock all the PVC you need, but the connectors are more tricky to find. You can try www.snapclamp.com for the fittings and some plans. More free plans can be found here www.pvcplans.com. The cold frame I built measured about 26” side to side , 20” tall at the highest point and about 14” wide. That should be ok for a couple of plants with enough height to allow them to grow and not be too crowded. 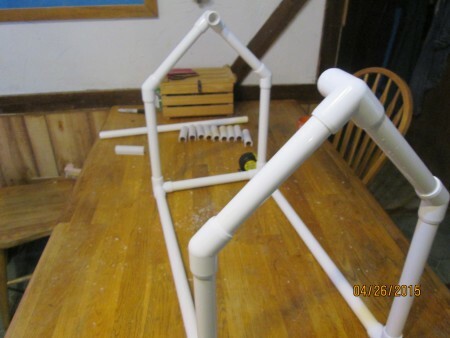 What I like about using PVC is that you can make things of any size quickly and as long as you don’t cement the pieces together, you can reuse the connectors and pipe in almost limitless variations. 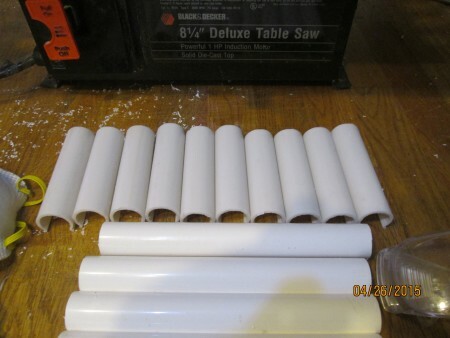 I used a portable table saw to cut the PVC. The dust mask and safety goggles were used to keep the plastic out of my lungs and eyes. Even though this was a small project ,the amount of plastic “ dust “ generated was quite a lot . I cut it all inside for convenience but next time I’ll set up the saw horses and do it outside. Here is an overview of all the pieces and tools to make this cold frame. 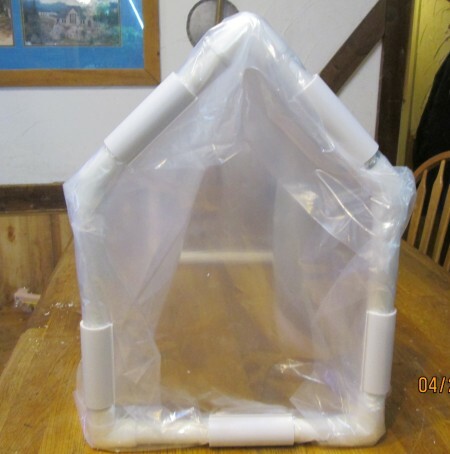 There are several more types of PVC fittings available, but I wanted to make the cold frame inexpensive, so I used only 2 types of the fittings. Total cost ( not including tax and shipping ) was $32.48 To make one bigger would cost very little extra. These are the snap clamps. I bought them in 1 five foot long section and cut them into 4 inch pieces myself to save a little money. You can buy them pre-cut though. Note, I tried using the snap clamps made for the 3/4 inch pipe , but they were a very tight fit over the plastic. So I went up a size to 1 inch clamps , which were much easier to work with since I assembled the cold frame a few times to try various configurations. But , if you want a tighter fit use the 3/4 inch size. Just don’t plan on taking them off too many times. 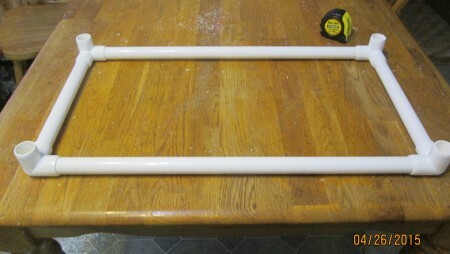 Step 3: Add the 4 pieces ( 10 “ long ) and the 3 way fittings that will allow you to attach the ridge piece. To make it a little faster and easier, I cut the plastic a little larger and just folded the excess under the snap clamp. Doing this saved a little time and if I wanted to re use the plastic on some other project later, the larger piece would come in handy. I used a piece of paracord in between the ends to keep the plastic from pushing against the plants. I could not seem to find a PVC fitting that would allow me to have a section of pipe to be used for this, so when in doubt, use paracord. 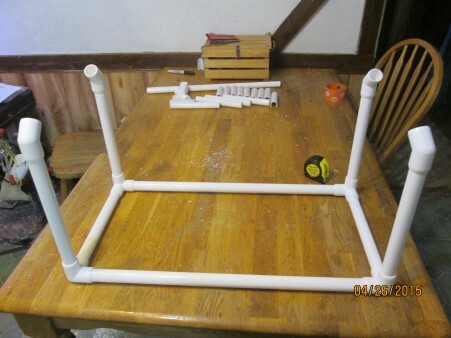 To wrap the ends of the cold frame I just cut the plastic and folded it around the pipe and held it all in place with the snap clamps. If I had used the smaller 3/4 “ snap clamps this would have been difficult indeed to do. Shown above is one side of the frame. That’s it. 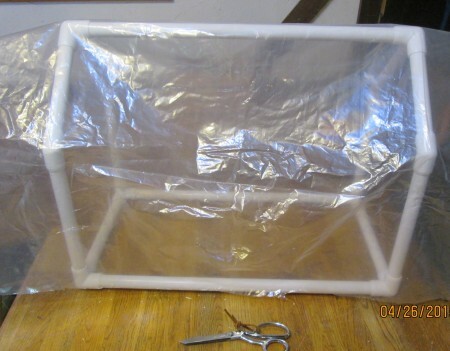 This will keep you seedlings and plants quite a bit warmer and will prevent wind damage to young plants. It might be necessary to anchor it to the ground with a couple of tent stakes in windy locations. In the summer, for cool loving plants, replace the plastic with a product called shade cloth. Basically a woven fabric that allows some light and water through it. It comes in various types , depending how much shade your plant needs. Still, I would not keep the plant covered 24 / 7 . The whole frame weighs only 2 pounds or so, so I would lift it up so the plant can get some sun. For some types and sizes of plants, you might only need the cold frame over night. In the spring, this will help the soil warm up a little faster and keep any light frost from hurting the seedlings, as well as discourage animals from eating you plants, up to a point. It will do a good job also, of holding humidity in. As I said earlier, you can make almost anything using these materials. The whole thing can be disassembled and easily stored when not in use, as long as you do not cement the pieces together. 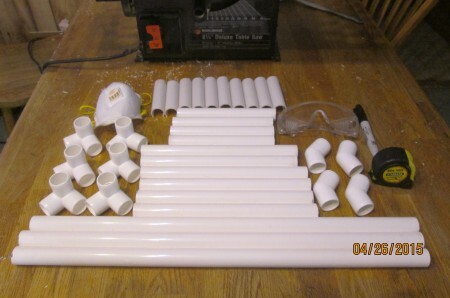 Look at the links I included to see many more ideas on how to use PVC.